"Armstrong, just who the hell do you think you are?" This excerpt from the monologue of Satchmo: A Tough Scuffle embodies the public persona of Satchmo, the jazz giant. However, Danny Mullen's one-man show introduces and educates through the life lessons of Louis Armstrong, the humble everyman from New Orleans. From the moment Mullen shuffled onstage as Satchmo, I felt less a member of the audience in the Alleyway Theatre and more a member of Armstrong's backstage community, waiting to hear his words of wisdom and testimonies of struggle and survival in America, in his relationships, and in the music industry. It was customary for Armstrong to invite his admirers into his dressing room, to speak with them as friends and family, and this show portrays how personable and relatable a man he truly was. Although classics like Moon River, A Kiss to Build a Dream On and Black and Blue are used to masterfully segue from Satchmo's monologues to his music, the show does not present itself as a musical. Instead, it is an opportunity for modern audiences to get the closest possible in-person glimpse of Satchmo in his natural element. It is comedic gold intermingled with emotive introspection and heart-to-hearts between a man and his people. As Armstrong, Mullen recounts the many facets of Satchmo's life, including his childhood, the development of his musical talents and his travels. More than anything, this production is the history of both Armstrong and American progression which was birthed from struggle, an aspect that inspired Mullen to take his show in its current direction. "Louis Armstrong was willing to sacrifice himself and his career for what he believed in, what was right," he said. The setting is Armstrong's dressing room, 1957, the year in which the Little Rock Nine made history. This moment led to a turning point in Armstrong's life, when he stepped out of the spotlight of performer and into that of activist. According to Mullen, this was not initially the focal point of his show, but under the auspices of theater producer and director Woodie King, Jr., he developed a storyline to tie together pivotal moments within Armstrong's life. The meeting of Mullen's new perspective and the storyline's own development was kismet. "Whereas before I was telling stories individually," Mullen said, "it came to me [to] make the story about the Little Rock Nine. It told me to do that." Mullen is careful not to lose Armstrong's keen sense of humor and optimism even when handling the seriousness of the times. There are plenty of moments during the show that illustrate just how Louis used humor to overcome hardships, making him such a charming figure everywhere he went. Full-circle moments put into perspective the development of Louis' character and add to the seamlessness of Mullen's storytelling. His ability to transform an open stage into an intimate dressing room is astounding and is a testament to his talent as a performer. He and Satchmo are indistinguishable; Mullen's performance is less a character portrayal and more a live-action autobiography. From his signature raspy voice, to his slow, confident sway across the stage and his infectious smile, he speaks, sings and moves as Armstrong, reflecting the 15 years of research and development that have gone into this production. I appreciate how, even in modern times, this adaptation of Satchmo does not feel modern, as it shouldn't. He is presented within a classic and historical context that is true to who he was. When watching Mullen onstage, you'll forget it's 2018. The creative direction makes the show a truly immersive experience. In fact, I was transported the moment I laid eyes on the set: a rotary phone and handwritten letters atop a worn, wooden vanity with incandescent lightbulbs, a table with a hotplate and steel pots--just some of the elements within the intimate "dressing room" that add to the nostalgia and authenticity of the production. These don't look or feel like props; they make it feel like Louis is present. Mullen finesses the crowd and the stage, like when he recounts Armstrong's memories while cutting a red bell pepper for gumbo. Subtleties like this stood out most to me, and the show was full of them. In the beginning, he "leaves" the stage a star, as roaring applause trails behind him. But the moment he steps "backstage" (onstage) he becomes a teacher, demanding the eyes and ears of his audience as students in a classroom. It is apt that the setting for this show is a dressing room, as Armstrong changes out of one occupation and puts on another. Mullen's ability to enlighten a crowd draws on his experience in theater and as well as a professor at Livingstone College. Although it is a one-man show, other elements also help bring the story of Satchmo to life. The sound of the train took me along as he traveled to Illinois, Mississippi, and back to New Orleans, where the sounds of Creole jazz conjured up Mardi Gras. I also enjoyed his moments of internalization as Armstrong, when reading a love letter from Lil Harden as "P.S. I Love You" plays in the background and he dips into a bowl of gumbo, or stands in a spotlight while reminiscing about the first time he saw Bill "Bojangles" Robinson in person. These were the moments when I most felt I was peering into the mind of Louis Armstrong. This show is a treasure, filled with gems. It is educational and entertaining, as well as an opportunity to revel in Armstrong's eras, when kings were named and queens were entertained. It is a privilege to get to know Satchmo the man, not just the entertainer. "He knew who he was," says Mullen. "I want us to know who he was because there's a little bit of him in all of us, because he is us." 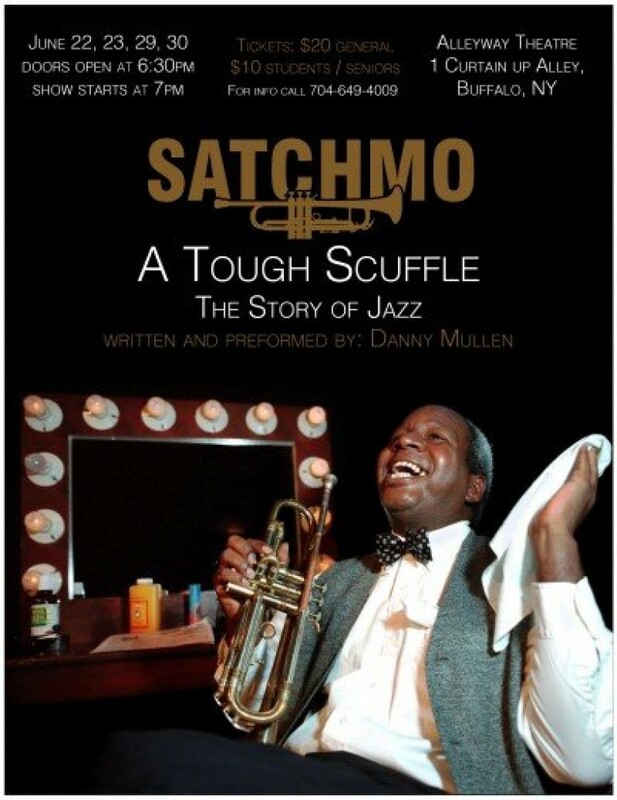 If you missed opening weekend, be sure to catch Satchmo: A Tough Scuffle on Friday, June 29 or Saturday, June 30 at the Alleyway Theatre. Each show is guaranteed to end as it begins--with roaring applause.